My journey to the Cycles Toussaint Velo Routier started with an impulsive act in October 2011. During Bike to Work Week Vancouver I ended up at an information session for The Ride to Conquer Cancer. Somehow I said to myself “I can do that” and signed up. What was I thinking! I was moved by the stories I heard but up until then my idea of “cycling” meant going out on a sunny afternoon and tearing around town for a couple of hours. I spent the following winter living in terror that I wouldn’t raise enough money or get in good enough shape to complete the 120km/day, two day ride, embarrassing myself before all the people I hit on for donations. I rode religiously, read books on training and by December realized the vintage Italian race bikes I was riding were not the right type of bike for this ride. Consequently I picked up a modern sport touring frame (Soma ES) and set it up with a triple crank with lots of low gearing, fenders and big fat 28mm tires. The day of the ride came and I had a ball. Lots of riders on fancy carbon bikes with skinny tires passed me but eventually I passed many of them on the side of the road fixing flats. It also rained for most of the first day and a half so I was grateful for the fenders. This led to more 120+km rides over the summer and a newly discovered love of distance cycling but also to an increasing feeling that this bike was just too much “touring” and not enough “sport”. The Ride to Conquer Cancer terminated in Seattle and the following day I had visited Elliott Bay Cycles near Pike Market. The place is a museum of vintage bikes and in the store was this slightly odd looking custom bike with a $7,000 price tag. Bob Freeman, the owner explained “that’s a 650B wheeled bike, they have quite a following here in the Northwest”. This sparked my curiosity and I started researching what these bikes were about. From what I could find out, they offer the smoothness and comfort of a wider tire with less mass and greater speed than 700c wheeled bikes. Well I’m not in the league to pony up $7,000 on a type of bike I’ve never ridden but I also discovered lots of people were taking regular frames and converting them to 650B wheels. As a result I spent the winter repainting a frame and building my own 650B conversion. My goal was to get the bike completed in time for the Tour de Victoria where I was signed up for the 100km leg. I built the wheels and installed Dai Compe 750 center pull brakes. The long-reach brakes were necessary to reach the braking surfaces on the smaller 650B rims. Three hundred kilometers of test riding in flat, dry Delta where I live gave me the false impression I was ready. The day of the ride dawned cold and damp and I knew the moment I rode up to the start line that my brakes were not handling the wet that well. No problem I said to myself, “I would take it easy, this is a ride not a race.” The first challenge was a long, steep climb up Munn Road. On the way to the top it began to rain in earnest. I reached the top OK but was not expecting the steep and narrow descent that followed. Within 200 meters I was fighting to control the bike and picking up speed. A third of the way down at about 50km per hour my wheels locked up throwing me to the ground. The next thing I knew I was looking at the sky trying to breathe. Medical support arrived quickly and I was transported to hospital where I spent a week with a broken collar bone, broken ribs and a collapsed lung. Lying around rehabbing gives you lots of time to think and I was already planning a safer 650B bike. I had checked out the Velo Routier the winter before and decided I liked the fact it was a Canadian company but most of all I liked the braze-on brake mounts. I had never cared for cantilever brakes and thought they looked out of place on a road bike. I ordered the bike and it was delivered within a week. During that week I picked up a new Ultegra 10 speed compact group on Craigslist and ordered online a set of matching hubs, Dura Ace 10-speed bar end shifters and Cane Creek SCR-5 Brake Levers. Most of the rest of the components would move over from the conversion. These included a Nitto Technomic 80mm Quill Stem and Nitto Rando Bars, Velocity Synergy Rims with an OC rear, Velo Orange Hammered Fenders, Brooks Pro Saddle and Soma Crane Brass Bell. Most ironic is the fact that the same brake calipers that landed me in the hospital, minus their wobbly center pieces, bolted straight onto the braze-ons on the Velo Routier. Finding nice, “look alike” 6mm chrome hex bolts to attach the calipers led me to an online motorcycle supply outfit in North Carolina, Scootworks.com (great service, inexpensive and fast shipping!). When the frame arrived I excitedly set about rust proofing it but when I assembled the headset I discovered that I had been sent a mis-matched frame and fork. The frame was 60cm and the fork for a 57cm bike. An email to Evan at Cycles Toussaint quickly remedied the situation and within a week I received a fork for the 60cm frame and a 57cm frame. This was a blessing in disguise as I had agonized over what size to order. I normally ride a bigger frame than my height might suggest but I was just not sure about a frame with low trail geometry. I built out the 60cm frame first and it turned out to be just right for me. The second frame will be sold off for charity. The build was remarkably easy! The fenders which had been a real chore fitting to the non-650B frame went on to the Velo Routier like soft butter on hot toast. The matching rack from Velo Routier is a very attractive addition and went on like it was made for the frame (it was). The only unexpected issues were the stack height for the headset was a bit long even after adding a center-pull quick release hanger and the brake set I had chosen did not allow for releasing the rear brakes to clear the wider tires. The stack height was remedied by a quick visit to my LBS for an additional headset spacer and the rear brake clearance corrected by a couple of inexpensive Jagwire in-line adjusters. As I am still rehabbing from my crash I have only had a couple of short runs to date but the ride is dreamy and fast. The brake power and modulation is excellent. I’m running 38mm Panaracer Col de la Vie 650B tires which are comfy and quick but would love to see how the bike handles with a set of Grand Bois Hetres. I am a born-again convert to 650B bikes and recommend them to anyone but if you are thinking of building a conversion, I say be very careful! I spied Cycles Toussaint on CycleExif http://www.cycleexif.com/cycles-Toussaint and it very much intrigued me as I have been looking for a 650b purpose built bike to try after reading, reviewing and researching 650b bikes on bike forums, at the North American Handmade bike show (which I went to in Portland and Sacramento) and the Oregon Handmade Bike show which I attended twice. I was only considering steel as I much prefer the supple and comfortable ride as well as the “traditional” look of small tubed steel. I also cannot afford a $5000-7000 650b bike though I have constantly growing appreciation for such a fine steed. After reading about Cycles Toussaint’s Velo Routier, I was further interested though not having seen one or ridden one I had to give it serious thought. I contacted Evan who politely and kindly informed me about Toussaint and the Velo Routier concept as well as his experience with his personal Velo Routier which he has ridden on some longish multi-day rides (100 – 200 km/day) with and without the front rando bag loaded. I informed him I wanted a bike for quick overnight dashes to camp as well as rides of 40-80 miles. I wanted to be able to ride dirt and gravel roads which are plentiful in the area I live and have the great fun exploring these roads and areas. I was more than pleasantly surprised upon receiving the bike. It had been packed with care and not a dimple in the shipping box despite travelling 1000 miles to me though it would have been nice to see bubble wrap or recyclable “styrofoam” pellets to cushion the bike in the box as their site distinctly implies. 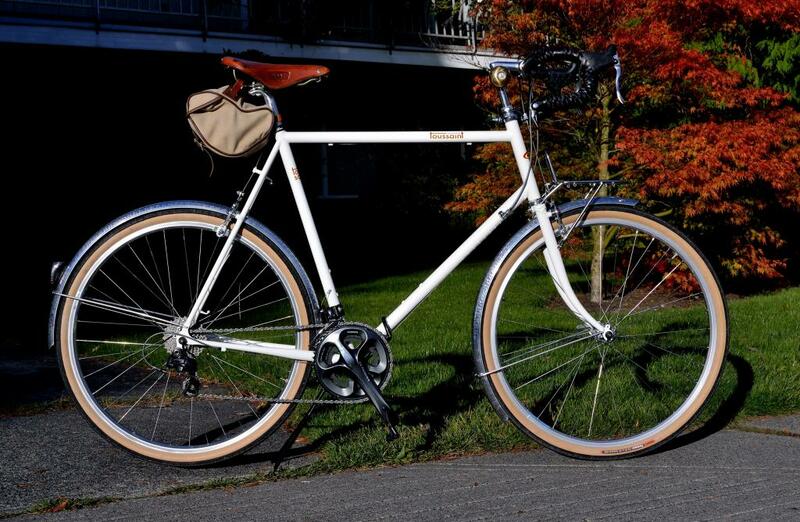 Their bikes are a complete bike; designed in constructeur style and complete with complete fender set in hammered aluminum with aluminum struts and leather washers, a stainless front mini-rack designed to affix a nice size rando bag and a good size stainless rear rack to affix panniers and/or rear rack bag atop the rack. The bike is not a heavy duty touring bike nor is it designed to be but rather more of a randonneur or brevet bike. The Routier went together well though I did substitute a Sachs “New Success” front derailleur because it has more compatibility with the very nice cranks which look very much like T.A. cranks and share same 50. 4 bcd thus ensuring an almost infinite range of gearing. The 46-30T compact crank and 10 speed cog set seem to be a good choice for the hilly and rolling terrain that I had ridden the bike on thus far. I have had 8 one to three hours rides on the bike so far. I took the bike on a quick overnighter which was only 38miles each way and affixed an Ostrich f-106 bag to the front and a copy of a Carradice saddle bag to the loops on the stock leather Gyres saddle which is a saddle similar to a Brooks Swallow saddle which is still breaking in, obviously. The bike comes complete with racks attached, rear fender attached and included a full size pump (yay, no mini pump:-P) which fits very snugly on the non-drive side seat stay which has 2 pump hooks brazed on. Also included were 2 nice quality bottle cages and a bell to go on the stem. It was interesting to see Dia Compe centre pulls; they modulate and stop well and look great as their finish matches the hammered and polished alloy fenders. 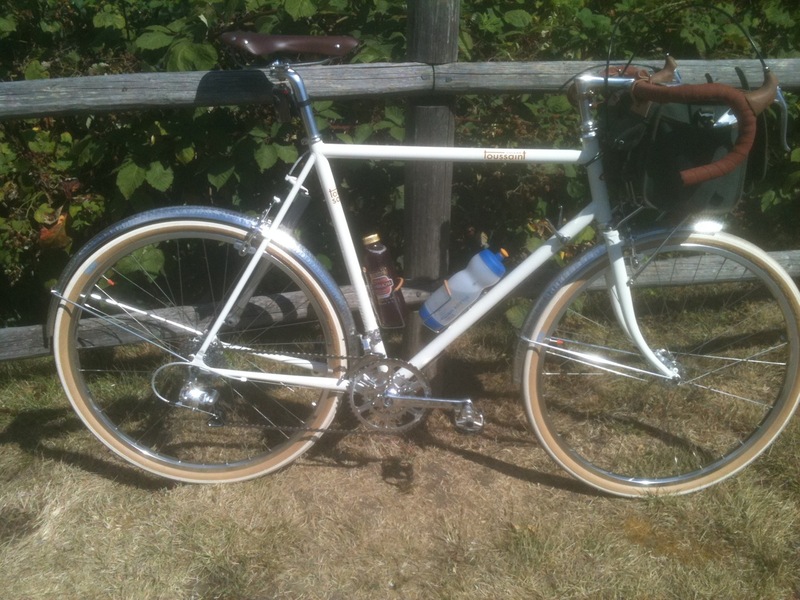 The racks and fenders have no rattles despite the bike bouncing along on the aforementioned gravel and dirt roads. It’s a great choice and an interesting one that the bike comes with the nice Pacenti Pari-Motos as they are an expensive tire and to have them come on any bike less than 3-4 thousand is yet another hint of this bike’s well thought out design. Too many bike companies try to scrimp on items and components to save on costs such as bottom brackets, headsets, hub bearings and aforementioned tires; Toussaint did not do this as the bike came with a needle bearing headset (to possibly prevent any front end shimmy which sometimes happens with low trail bikes) and a sealed cartridge bottom bracket which seemed to be on par with an ultegra level unit. It is nice to see alloy cups on the bottom bracket rather than silly plastic ones. The fit of the 57cm bike seems ideal for me with the supplied 120cm stem and I find the bike very comfortable to ride over varied terrain. The bike is quick to spin up (likely due to 650b wheel size and the light, lively and supple 300gram Pari-Moto tires) and cracks and ripples in tarmac are hardly felt. I am experimenting with tire pressure to see what works best on the different road surfaces and the load carried on the bike. The finish of the frame and evenly applied decals gives the overall package a classy yet elegant look though I wish a head badge were on the bike. Any questions I have had about the bike were quickly answered by Evan. Cycles Toussaint is a very new company (started in spring 2012) and clearly the designers of the bike and its components and overall package and aesthetic have been given great thought and the down tube shifters are not just a nod towards traditional constructeur type bikes but they shift swiftly and with accuracy. There is no other company that offers the value, finish, degree of detail and design and ride of a 650b randonneur or brevet style of bicycle that cycles Toussaint delivers! This is their first offering and I would strongly recommend any cyclist to seriously consider Toussaints components or bicycles if seeking this style of machine! I would not hesitate to purchase another bike or parts from cycles Toussaint! The price of approximately $1700-1800 for the complete bike is truly an unheard of value.